A multitalented consultant markets her services in writing, in advising about charitable giving and in advising non-profit organizations. 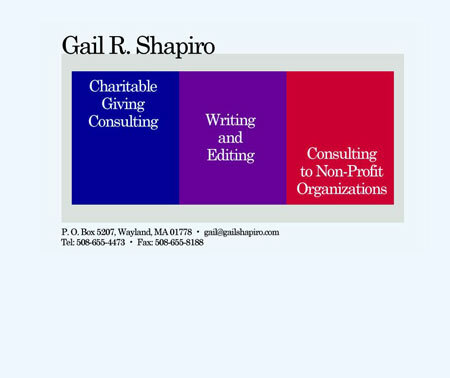 A friend, neighbor and sometime proof-reader Gail has used the Web for many ventures from book publishing to marketing services to running a non-profit of her own helping women manage finances. The most recent redo of her Web site challenged us to promote her three areas of expertise and focus!